Badia, R.M. ; Labarta, J.; Marjanovic, V.; Martín, A. F.; Mayo, R.; Quintana, E.; Reyes, R.
We investigate the use of the SMPSs programming model to leverage task parallelism in the execution of a message-pas sing implementation of the symmetric rank- k update on clusters equipped with multicore processors. Our experience shows that the major difficulties to adapt the code to the MPI/SMPSs instance of this programming model are due to the usage of the conventional column-major layout of matrices in numerical libraries. On the other hand, the experimental results show a considerable increase in the performance and scalability of our solution when compared with the standard options based on the use of a pure MPI approach or a hybrid one that combines MPI/multi-threaded BLAS. Badia, R.M. [et al.]. 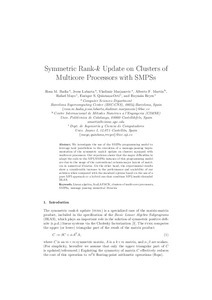 Symmetric rank-k update on clusters of multicore processors with SMPSs. A: International Conference on Parallel Computing. "Applications, Tools and Techniques on the Road to Exascale Computing". Ghent: IOS Press, 2011, p. 657-664.